In a delicious serving of a dish called irony, Amazon (s AMZN), the online retailer that made its name undercutting traditional retailers, is now teaming up with them for its Amazon Lockers service. Both Staples and RadioShack will install these lockers in their stores, allowing customers to buy from Amazon and ship packages to these lockers and then pick them up later. Geekwire notes that there are other outlets — 7-Eleven and the grocery chain Albertsons – that are also signing up for the delivery lockers. If you are wondering why these retail chains are sleeping with the enemy, the answer is foot traffic. If people are coming to stores to pick up their packages, there is some likelihood that they might pick up other goods. Groceries or Big Gulps, sure, but paper goods and electronics, too. Isn’t that what Amazon is for? This local-locker move by Amazon is one of the reasons Silicon Valley has been abuzz about a Canadian startup, BufferBox, based in Waterloo, Ontario. It is a simple idea: There will a locker at a certain retail location, which will become your address and you can ship your packages there. Once you get your package, you get an email with a PIN number and that is what you need to open the locker and get your package. BufferBox take a cut of the delivery costs. It is targeting the growing number of people who typically are unable to receive their packages at home during the day when the postal delivery person or the UPS dude calls. It was started by University of Waterloo, Ontario, students Aditya Bali, Jay Shah and Mike McCauley in 2011, and it was part of the recent graduate class of YCombinator. It has a few lockers in and around the Toronto area. The company has raised nearly $3 million in angel funding. Paul Graham has been high on this company and rumors are that even Jeff Bezos was pretty enamored with them. Mike Issac in a post mentioned that BufferBox lives in a crowded market – ShopRunner and Kiala (in Europe) are two competitors to the upstart. Then there is MissNev, a company we recently wrote about. However, it is Amazon, the 800-pound gorilla, that BufferBox has to worry about. However, fear of Amazon is enough to get Google or some other giant galvanized into snapping up this startup. I have heard rumors that Google (s GOOG) is interested in buying the company for an amount that should get the angel investors singing in the rain. Google, which is pushing hard to get traction for its Google Checkout service, could use something like BufferBox as a way to get more businesses to use its service. For retailers, the lure of foot traffic is pretty strong. “Amazon created a whole new opportunity for us,” McCauley told Wall Street Journal. If Google (or someone else) ends up buying the company, he (and his co-founders) can say that again! 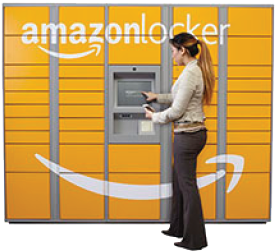 Who are other E-commerce players like Amazon or Google who would be interested in using a locker service for their business? Shocking really, in an age of supposed Telecommuting and 247 communication, everyone are too busy out slaving to pay for their Debts on the place they are never in long enough, to have a package they paid for brought to them. I mean to say, this service is a retardation …. it’s like the Post Office here in Spain, who don’t deliver parcels to the House anymore, simply because the Union Staff are bone idle. I can see the value of this, but it is so sad. Google is ever so carefully getting into the ecommerce game. At any rate the more the merrier, its a fantastic solution, in Germany they even have them in train stations, so you can get packages shipped to you while on the road. It’s pretty awesome. I think UPS (which bought Kiala) and Fedex/DHL may be interested as well, but Amazon and Goog are definitely the frontrunners. Isn’t this the same than the DHL Packstation? Its been around since 2001 in Germany, even with the same color and general design. It just might be a variation of that idea.